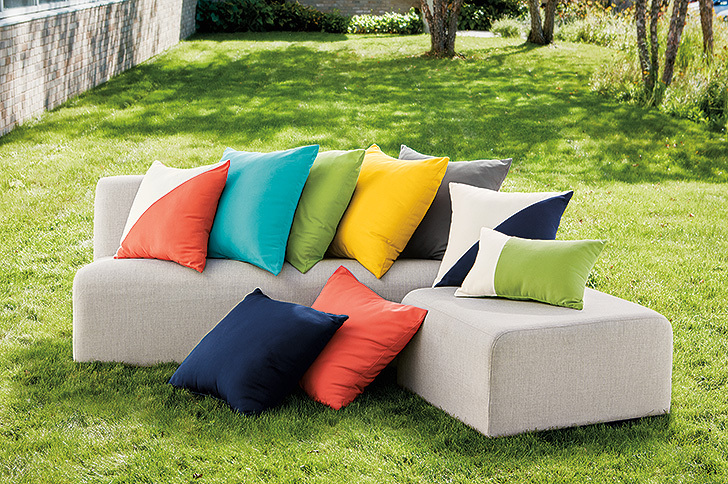 Why do we use Sunbrella fabric for our outdoor upholstery and pillows? Simple: It resists fading, chlorine, stains and mildew. But did you ever wonder why Sunbrella lasts and lasts when other, seemingly similar fabrics fall short? Sunbrella uses a “carrot and radish” analogy to explain the difference. Sunbrella gets its longevity from UV-stable pigments that they add as they create the acrylic fibers. This creates nearly fade-proof colors that are part of each fiber (like the orange of a carrot) instead of being applied to the surface (like the red of a radish). The fabric has a tight weave that gives it stability and a special finish to enhance water repellency, so water beads on the surface during light rain, rather than soaking in. We offer Sunbrella in a range of timeless colors, from neutral to bright, to help you create an inviting outdoor space that will look great season after season. See all of our modern outdoor furniture and accessories here to design your own backyard oasis.